On the Design tab, select Watermark. Choose a pre-configured watermark, like DRAFT or CONFIDENTIAL. 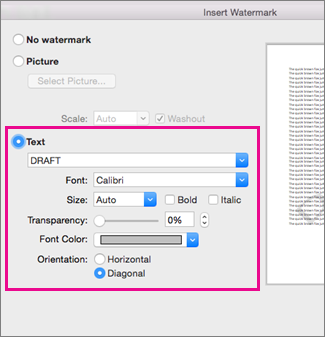 In the Insert Watermark dialog, select Text and either type your own watermark text or select one, like DRAFT, from the list. Then, customize the watermark by setting the font, layout, size, colors, and orientation. If you don’t see the watermark, click View > Print Layout. This also shows how the printed watermark will look. On the Page Layout tab, select Watermark. On the Layout tab, under Page Background, select Watermark. Type or edit your text for the watermark, or select a text watermark from the drop down menu, and then select the text formatting that you want. If the text watermark makes it difficult to read the text on the page, increase the transparency of the watermark text, or select a lighter color for the watermark text. You can use the Size drop down menu to change the size of the watermark text. In Word Online you can see watermarks that are already in a document, but you can’t change them or insert new ones. If you have the Word desktop application, use the Open in Word command to open the document and insert or change a watermark there. When you’re done and you save the document, it will continue to be stored where you opened it in Word Online. When you reopen it, you’ll see the watermarks in the doc.